"There was the liver, the lungs, the heart, all set out on the table like a butcher's display case. This'll sound stupid, but I thought of Mozart. I thought, 'How can stuff compose music like that?'" We've seen plenty of cop films over the years, and France has made its share of flic flicks. 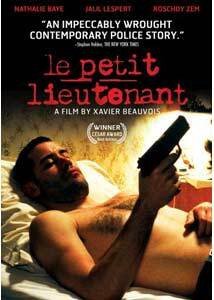 One of the more recent entries is Le petit lieutenant, a 2005 picture from director Xavier Beauvois that eschews the usual cliches for something more realistic and involving. It doesn't pack the thills of a typical genre movie, but the emphasis on character and behavior makes this more absorbing than you'd expect. Antoine (Jalil Lespert) is a lieutenant freshly out of the academy, and the film follows his settling in to his new posting in a Parisian detective unit. The unit is led by Caroline Vaudieu (Nathalie Baye), a veteran cop whose career was derailed by alcoholism. Her return to the force conincides with Antoine's own entry to the job, and the pair develop a mother and son type bond; Caroline's own son died years before, and Antoine fills that void in her own life. When a murder occurs, the investigation lead to a surprising event that comes as a shock. The film is filled with everyday details that make it a pleasure to watch, from the opening sequence in which we see the academy graduates selecting their new locales, to Antoine receiving his gun, to simple get-togethers between the members of the unit. It's refreshing in many ways, as the picture we get, whether true to real police work or not, at least feels more real. The cast perform admirably, with Baye doing an especially fine job as the troubled inspector, and Lespert as the earnest but in many ways emotionally dishonest young cop. This isn't a happy film by any means, but well worth your time if your taste runs to intelligent crime films. The everyday quality of the characters we see make this rise above the norm, ironically enough. The end of the case doesn't necessarily bring closure, simply as much of the story that we're allowed to see. And the final shot provides a haunting close to the film, indicating that nothing is really solved, at least internally, for Baye's character. Image Transfer Review: The enhanced 1.85:1 transfer is clean enough, with decent detail and color, though moments of occasional softness occur here and there. Stepping through the image indicates a PAL conversion, but I thought it looked fine in motion. The subtitles are white and free of glaring typos. Audio Transfer Review: French tracks in Dolby 5.1 and 2.0 are on hand, and the 5.1 track was the one I watched the film with; it does a fine job with a good, well-defined mix. Extras Review: A trailer and photo gallery comprise the only extras. A solid, well-made police procedural, with well-drawn characters and a thoughtfully developed script. Those looking for slam-bang shoot-out action will find this not to their liking, as the emphasis is on character rather than flash, but it's a nice antidote to the usual thought-free stuff out there.